Because of difficulty rendering Greek characters and the PNG image files contained in the document, you may have difficulty viewing this file with older web browsers. In particular, I have been unable to view Greek characters on older versions of Netscape (4.6 and below). You may also experience difficulty printing this document. In particular, Greek characters may not appear in the printed document on some platforms. I was unable to get Greek characters to print using Netscape 4.7 on either Linux or Windows NT. However, Greek characters were printed when I used Netscape 4.7 on MacOS. Your experience may be different. If you have trouble printing the figures in the document, let me know and I can make smaller versions or even PostScript versions of the figures available. If you have any questions, comments, or suggestions, please drop me an e-mail at aleahy@knox.edu. A paper explaining some of the modern interpretations of this work can be found here. Let KB be any simple and non-winding curve--that is, from K to B always drawing closer to a certain line MP given in position or always receding from it. Let (as in the first figure) K be the point on the curve KB closest to the line MP. From any two points, say, C and B, on the curve KB let perpendiculars CO and BP hang down to the line MP. From the point C on the curve let a line CA tangent to the curve at C be drawn as close as possible to the point K and intersecting the extended line PB in A. I say that the line CA is greater than the curve CB. Let a line BRD be drawn tangent to the curve at B and intersecting the line CA in R and the extended line OC in D. Since the curve KB is always moving away from the line PM in the advance from K to B, therefore the line BD, tangent to the curve in the point B and inclining back toward K, extends to an intersection with the line PM. Therefore, the angle ABR is obtuse, being certainly greater than the right angle MPB, into which it runs when PM is extended. Therefore, the angle ABR is greater than the angle RAB and the side AR is greater than the side BR. By adding the common part, the line AC is more than the lines BR and RC. But BR and RC, touching the curve in the points B and C, respectively, are more than the arc BC. Therefore the line AC is much more than that same arc CB, which it was desired to demonstrate. Second, I say that the line BD is less than the curve BC. By what has been demonstrated up until now the angle ABD is obtuse and likewise, because AP and DO are parallel, angle CDB equals angle ABD. Consequently with the subtending line CB having been drawn, the angle BDC is more than the angle BCD and the line DB less than the line BC. But the line BC is less than the curve BC and therefore the line BD is much less than the curve BC. From the extremal points K and B let perpendiculars KM and BP be sent down to the line MP. Next, let the line MP be divided into how many so ever equal segments MN, NO, and OP. 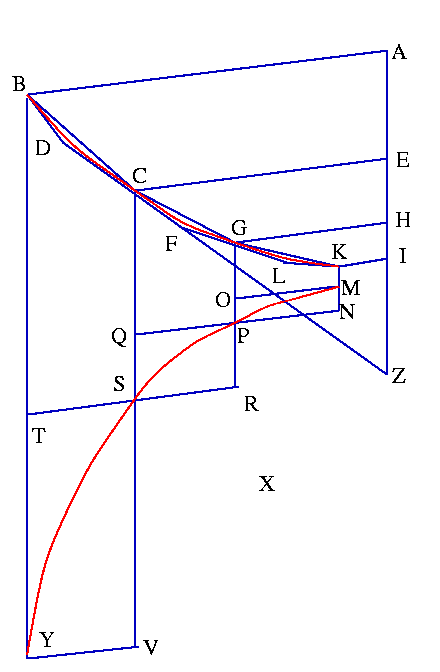 From the points P, O, N, and M erect perpendiculars PA, OE, NH, and ML, respectively, cutting the curve in the points B, C, F, and K, from which, respectively, are drawn toward B lines KH, FE, and CA tangent to the curve and terminating at the nearest perpendicular. Let the tangent BD at the point B terminate at the closest perpendicular toward K in the point D, and let KI be parallel to the line BD: It is manifest that KH is more than the line KI because the obtuse angle HIK is equal to the angle ABD. I say that all of the lines KH, FE, and CA together are more than the curve KB and that the excess of the line HK over the line KI is more than the excess of all of the lines KH, FE, and CA together over the curve KB. Let the tangents AC and EF be extended to L and G, respectively, on the nearest perpendiculars toward K. From the first result, AC is greater than the curve BC, EF is greater than the curve FC, and HK is greater than the curve KF. Consequently, together all of KH, FE, and CA are more than the unbroken curve KB. From the second result, BD (that is, KI) is less than the curve BC, CG (that is, CA) is less than the arc FC, and LF (that is, FE) is less than the arc KF. Consequently all of KI, FE, and CA together are less than the entire curve KB and hence the excess of the lines KH, FE, and CA over the lines KI, FE, and CA is more than their excess over the curve KB. But the lines FE and CA are common to each sum of lines and consequently the excess of the line KH over the line KI is equal to the excess of the sums of the lines KH, FE, and CA over the sum of lines KL, FE, and CA, which demonstrates that this excess is greater than the excess of the lines KH, FE, and CA above the curve KB, which is what ought to have been demonstrated. 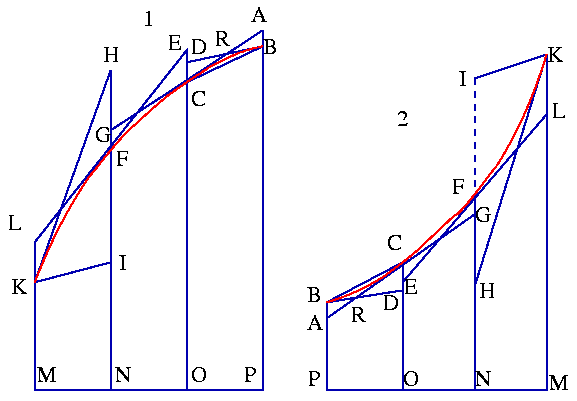 If the actual curve slopes down toward the line MP, as in the second figure, K ought to be the point on the curve most remote from the line MP and some words in the demonstration ought to be changed, as the industrious reader will understand for himself. Let 79CD be any simple and non-winding curve (if indeed it were winding, it is reasonable to divide it into many simple curves) above which is imagined the surface of a right cylinder whose altitude is the line X. From some point of the curve, say, 9, let a line 93 be dropped down perpendicular to a line, say, 26. Also, let a line 96 cutting the curve normally in the point 9 be drawn to the line 26. Let the line 39 be extended to a point S such that 3S is equal to the line 96. It should likewise be supposed that this is done in all points of the curve 79CD in such a way that from the lines perpendicular to the curve extended normally to the line 26 through their own points a region RV δ2 composed of the curve RSTV and the lines R2, Vδ, and δ2 is produced. Next, let the altitude X of the cylinder be to 3N as 93 is to S3. Likewise, we suppose that this is done in all the other lines of the region RVδ2 perpendicular to the line 2 δ, so that a region PHδ2 comprised of the curve PH and the lines Hδ, P2, and 2δ is filled out. That is, I understand that two regions have been described, the first of which has the property that the perpendicular S3 sent down to the line 26 out of whatever point S of its curve is equal to the normal to the curve 79CD at the point 9 of the intersection, specifically, the line 96. However, the second has the property that the perpendicular 3N dropped down to the line 26 out of whatever point N of its curve is to the altitude X of the cylinder as the part intersecting with the first area S3 is to the part of N3 intersecting the given curve 93. I say that the second curved area PHδ2 is equal to the surface of the right cylinder whose base is the given curve 79CD and which has line X as the altitude. If the area of PHδ2 is not equal to the surface of the cylinder mentioned before, there will be a difference between them which will be a planar figure α. Let the planar figure α be applied to the line X and let the side β be the breadth. Let a line 7A be drawn from the point 7 tangent to the curve D7 at the point 7. From the point D let a line Dγ be drawn touching the curve in the point D and let line 7ν be parallel to the line Dγ. From the points 7 and D let perpendiculars 72 and δD be dropped to the line 26 and let the line 2δ be divided into so many equal parts that from N3, the last perpendicular erected, the excess of the tangent 7A beyond the parallel line 7ν is less than the line β. Indeed, it is manifest that this is always able to be done if the tangent 7A is not perpendicular to the line 2δ and the given curve is non-winding. 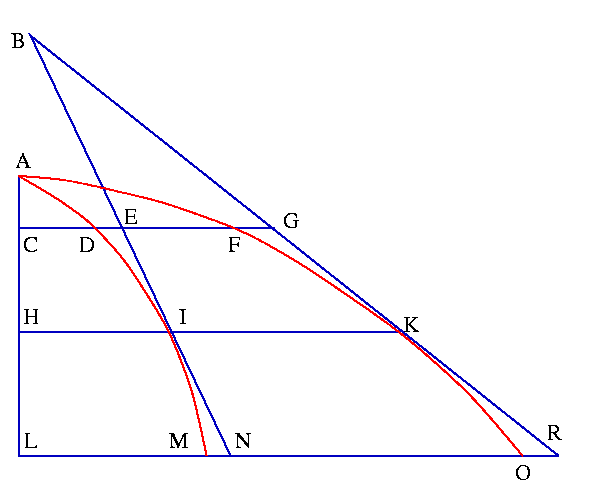 From the points 2, 3, 4, and δ of the partition of 2δ let perpendiculars 2P, 3N, 4L, and δH be erected, cutting the given curve in the points 7, 9, C, and D, the first invented curve in the points R, S, T, and V, and the second invented curve in the points P, N, L, and H. Then, let lines 7A, 9B, CF and Dγ be drawn tangent to the given curve at the points 7, 9, C, and D and terminated at the closest perpendiculars. Let 78, 90, CE, D5, YP, NK, LG, HI, LM, and NQ be lines parallel to and equal to the corresponding parts of 2δ and terminated in the nearest perpendicular. The angle B96 is right, because 9B is a tangent and 96 is a perpendicular to it. The angle O93 is also right. Consequently, with the common angle O96 being taken away, an angle O9B equal to the angle 693 remains. Therefore, the right triangles O9B and 693 are similar and hence as 93 is to 96, so is 9O to 9B. But as 93 is to 96 so is X to 3N. Consequently, as 9O is to 9B thus is X to 3 N. Therefore, the rectangle formed by 9O and 3N--namely, N4--is equal to the rectangle formed by 9B and X. By this same method it is demonstrated that the rectangle P3 is equal to the rectangle formed by 7A and X and that the rectangle Lδ is equal to the rectangle formed by CF and X. Consequently, the rectangle formed by the line X and the lines 7A, 9B, and CF together is equal to the entire rectilinear figure 2PYNKLGδ. Therefore, the rectangle formed by X and the lines 7A, 9B, and CF together is more the area of the curved figure PNLHδ2. Let DΠ be the normal to the curve at the point D. Therefore, the angle ΠDγ is right. But the angle δD 5 is also right. Consequently, by taking away the common angle, namely δD γ, it follows the angles δDΠ and γD 5 are equal. Therefore, the right triangles δD Π and γD 5 are similar. Consequently, as δD is to DΠ--that is, as D5 is to Dγ--so is X to δH. Therefore, the rectangle formed by δH and D5--that is, the rectangle H4--is equal to the rectangle formed by X and Dγ--that is, by X and 7ν. But the rectangle M4 is equal to the rectangle Lδ--that is, to the rectangle formed by X and CF--and the rectangle Q3 is equal to the rectangle N4--that is, to the rectangle formed by X and 9B. Therefore, the rectilinear figure QNMLIHδ2 is equal to the rectangle formed by X and the lines FC, B9, and ν7 together. Therefore, the rectangle formed by X and the lines FC, B9, and ν7 together is less than the curve PNLHδ2. On the other hand, the lines FC, B9, and A7 together are more than the curve 79CD and the lines FC, B9, ν7 together are less than the same curve, each of which is clear from the preceding result. Therefore, the rectangle formed by X and the lines FC, B9, and A7 is more than the surface of the cylinder above the curve 79CD and the rectangle formed by X and the lines FC, B9, and ν7 is less than that same curve. But it was demonstrated that the rectangle formed by X and the lines FC, B9, and A7 is more than the area of PNLHδ2 and that the rectangle formed by X and the lines FC, B9, and ν7 is less than that same area. Consequently, the difference between these rectangles is greater than the difference between the surface of the cylinder and the area. But the difference of these rectangles is the rectangle formed by X and the difference of the lines 7A and 7 ν. Moreover, the difference of the lines 7A and 7ν is less than the line β by supposition. Consequently, the difference between the rectangle formed by X and FC, B9, and A7 together and the rectangle formed by X and FC, B9, and ν7 together is less than the quantity α--the rectangle formed by X and β, which is, by supposition, the difference between the surface of the cylinder and the curved area. This is absurd. Therefore the surface of the cylinder and the area are equal, which is what ought to have been demonstrated. If the curve 7D were not simple but winding, it should be divided into many simple pieces and the demonstration carried out individually on each. To be sure, if the tangent 7A were perpendicular to the line 78, the curved region PNLHδ2 would be extended infinitely to the point P. Since this does not stand in the way, I say to this that the area of PNLHδ2 is equal to the surface of the right cylinder about the curve 79 CD, whose altitude is X. If they are not equal, let (if possible) the curved region be more than the surface and let the area NLHδ3, equal to the surface above the curve 79CD, be cut off by the line N3 parallel to Hδ. Indeed, without a doubt this is able to be done. By the same method as before, it is demonstrated that the area NLHδ3 is equal to the surface above 9CD. Therefore, the surface of the right cylinder whose altitude is X over the curve 9CD is equal to the surface of the right cylinder whose altitude is X over the curve 79CD, which is absurd. Therefore, the area of PNLHδ2 is not more than the said surface of the cylinder. Suppose (if it is possible) that it is less, and let the curve 9D be cut away so that the surface of the right cylinder existing above 9D is equal to the area of PNLHδ2. Let a line 39N be drawn parallel to the line Hδ. It is demonstrated as before that the surface of the right cylinder existing over 9D is equal to the area of NLHδ3. But by supposition the same surface of the right cylinder is equal to the area of PNLHδ2. Therefore the areas PNLHδ2 and NLHδ3 are equal among themselves, which is absurd. Consequently, the curved region is not less than the surface, but in fact it has been demonstrated that neither is is more. Therefore the surface of the right cylinder above the curve 7D whose altitude is X is equal to the area PNLHδ2, even when the tangent 7A is perpendicular to the line 78, which is what ought to have been demonstrated. From this demonstration, it is manifest that the area of PNLHδ2 and the surface of the cylinder about the curve 79CD are proportional quantities in magnitude and weight, since the same equality which is demonstrated about their entireties is demonstrated in the same manner about their proportional parts. Consequently, by this same method their centers of equilibrium divide the line 2 δ. But the curve 7D itself is proportional in magnitude and weight with the surface of the cylinder. Consequently, the curve is in fact proportionate in magnitude and gravity with the curved region as well as with the remaining ones having the center of equilibria on the line 2 δ. It is also observed that the area of PNLHδ2 is to the rectangle formed from X and 2δ as the curve 79CD is to the line 2 δ. With the same things being assumed as in the previous result, let it be supposed that the surface of the right cylinder above the curve 79CD is cut by a plane passing through the line 2δ and inclining toward the plane Dδ2 in a 45 degree angle. We call the lower part of the surface of the cylinder cut by the plane the surface of the trunk. I say that the surface of the trunk is equal to the curved region RSTVδ2. Let the curve 79CD be supposed to be extended into a line ΓΛΣΔ equal to itself and let a line Δp equal to the line X be joined so that a rectangle hpΔΓ which is necessarily equal to the surface of the cylinder and to the curved region PNLHδ2 is filled out. Let Γε be equal to the line 27 and from the point ε let a curve ερψΩ be drawn of such a nature that, when any line ΓΛ equal to some small part of the curve, say, 79, has been assumed, the perpendicular to the line ΓΛ at the point Λ on the curve εΩ, namely Λρ, is equal to the perpendicular from the point 9 to the line 2δ--namely, 93. It is manifest that the curved region ερψΩΔΓ is equal to the surface of the trunk, since the inclination of the cutting plane is assumed to be a 45 degree angle. Therefore, our proof is to demonstrate the equality of the curved regions RSTVδ2 and ερψΩΔΓ. First, we will demonstrate this equality in the latter figures, where we suppose that the curve RV always draws closer to the line 2δ in the progression from R to V and likewise that the curve 7D draws closer to that same line in the progression from 7 to D. Therefore, the curve εΩ draws closer to the line ΓΛ in the progression from ε to Ω , since when 7D draws closer to the line 2δ the curve εΩ draws to the line ΓΛ in the same manner. If the curved surfaces mentioned above are not equal, let α be the difference between them and let the curved region RVδ2 be divided into so many lines parallel to the line R2--namely, S3, T4, Vδ, and R2--that when the perpendiculars Rξ, Sγ, Sλ, Tθ, and Tμ, and Vη have been drawn from the intersections R, S, T, and V to the nearest parallels on either side there are two rectilinear regions, namely, RξSλTμδ2 above the curved region and γSθTηVδ2 within the curved region, the difference of which is less than α. It is evident that this is able to be done. Let the lines S3 and T4 be extended so that they intersect both curves PH and 7D in the points N, L, 9, and C, and let the lines PY, NQ, NK, LM, LG, and HI, parallel to 2δ and terminated by the dividing lines of the curved region, be joined. Next, let the rectangle hΔ be divided by the lines hΓ, kΛ, mΣ, and pΔ, parallel to the line pΔ into the rectangles hΛ equal to the curved region PN32, kΣ equal to the curved region NL43, and mΔ equal to the curved region LHδ4. From the intersections of the lines dividing the rectangle hΔ with the curve εΩ, namely, ε, ρ, ψ, and Ω, let perpendiculars be drawn in both directions to the nearest dividing lines, namely, εζ, ρπ, ρσ, ψτ, ψω, Ωφ, so that πρτφΩΔΓ is a rectilinear figure within the curved region and εζρσψω ΔΓ is a rectilinear figure circumscribing the curved region. It is apparent from the previous proposition that P2 is to X--or hΓ--as R2 is to 72--or εΣ. By permuting, as P2 is to R2, thus is hΓ to εΓ. Therefore, as P3 is to R3, thus is hΛ to εΛ. But the rectangle hΛ is equal to the curved region PN32. Therefore, by permuting, as P3 is to the region PN32, thus is R3 to εΛ. Since P3 is greater than the curve, R3 will be greater than εΛ. In this same manner it is demonstrated that the rectangle S4 is more than ρΣ and that Tδ is more than ψΔ. Therefore, the rectilinear figure RξS λTμδ2 is more than the rectilinear figure εζρσψωΔΓ. In the same manner, as N3 is to X--or kΛ--thus is S3 to 93--or ρΛ. By permuting, as N3 is to S3 thus is kΛ to ρΛ. That is, as Q3 is to γ3, thus is hΛ--or the region PN32--to πΛ. By permuting, as Q3 is to the region PN32, thus is γ3 to πΛ. But Q3 is less than the curve. Therefore, γ3 is less than πΛ. In the same manner, it is demonstrated the θ4 is less than τΣ and ηδ is less than φΔ. Therefore, the rectilinear figure γS θTηVδ2 is less than the rectilinear figure πρτψφΩΔΓ. Therefore, both rectilinear figures εζρσψωΔΓ and πρτψφΩΔΓ are between the two rectilinear figures RξSλTμδ2 and γS θ TηVδ2. That is, the greater of the first rectilinear curves is less than the greater of the second curves and the lesser of the first curves is more than the lesser of the second. 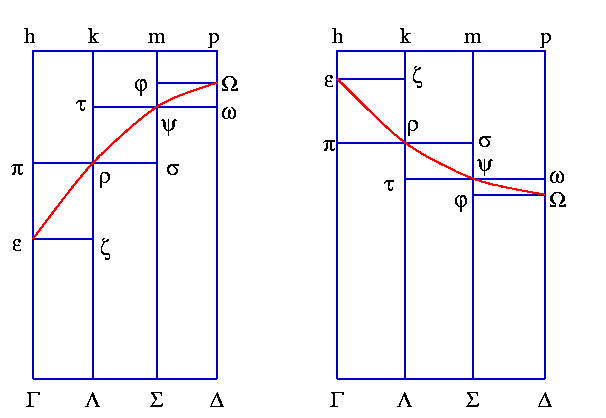 The curved region ερψΩΔΓ is between the two first rectilinear figures and therefore is likewise between the two latter rectilinear figures, namely RξSλTμδ2 and γS θTηVδ2. But the curved region RSTVδ2 is likewise between these two rectilinear curves. Therefore, the difference between the rectilinear curves RξSλTμδ2 and γSθTηVδ2 is more than the difference of the curved regions RSTVδ2 and ερ ψΩΔΓ. But by supposition, the difference of these rectilinear figures is less than α. Therefore, the difference of the curved regions is much less than α, which is absurd. In fact, equality is shown. Therefore, the curved regions RSTVδ2 and ερψΩΔΓ do not differ. In fact, they are equal, which it was desired to demonstrate. Second, we will demonstrate the same equality in the first figures, where we suppose the curve V always draws closer to the line 2δ in the progression from R to V and, in contrast, the curve 7D in the progression from 7 toΔ is protracted more from the same line. Therefore, on that account, the curve εΩ is more extended from the line ΓΔ in the progression from ε to Ω, since when 7D is extended from the line ΓΔ in the same manner the curve εΩ is extended from the line ΓΛ. If the curved regions are not equal, let their difference be α. Next, let the curved regions RSTVδ2 and let ερψΩΔΓ be divided by lines perpendicular to their bases 2δ and ΓΔ. It is done entirely as in the preceding demonstration, however, with the stipulation that the difference of the rectilinear figures RξS λTμδ2 and γSθTηVδ2 and also the difference of the rectilinear figures πρτψφ ΩΔΓ and εζρσψωΔ Γ together are less than the quantity α. It is manifest that this is possible, since this division is able to be done infinitely. 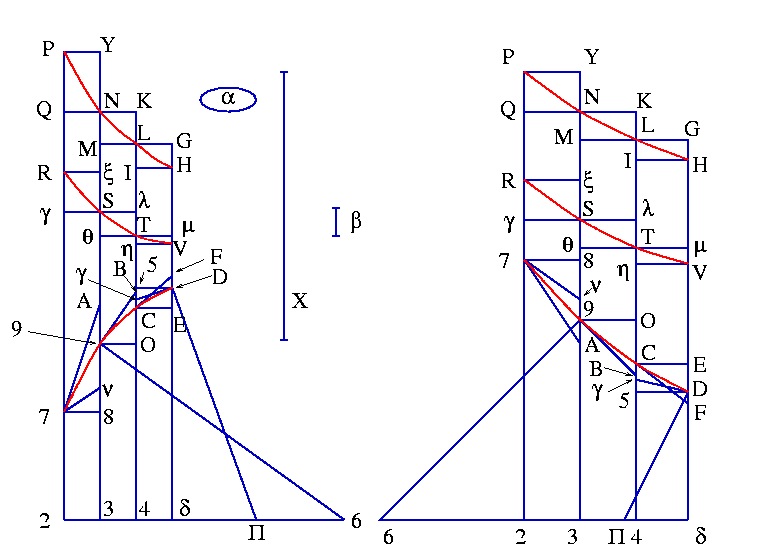 With the same method which we used in the previous demonstration, it is demonstrated that the rectilinear figure RξS λTμδ2 is more than the rectilinear figure πρτψφΩΔΓ and the rectilinear figure γ SθT ηVδ2 is less than the rectilinear figure εζρσψωΔΓ. With these things having been understood, if the given curved regions are not equal, let RSTVδ2 be more than the other. It is manifest that the excess of the rectilinear figure RξSλTμδ2 above the rectilinear figure εζρσψω ΔΓ is equal to all the rectangles γξ, θλ, ημ, πζ, τσ, and φω together with the excess of the rectilinear figure πρτψφ ΩΔΓ above the rectilinear figure γSθTηVδ2 having been removed. But the excess of the greater curved region above the lesser curved region is less than the previous-mentioned excess of the rectilinear regions, since the greater curved region is less than the greater rectilinear figure and the lesser curved region is more than the lesser rectilinear figure. Therefore, the excess of the greater curved region above the lesser curved region is less than the previously-mentioned rectangles together with the excess of the rectilinear figure εζρσψωΔΓ above the rectilinear figure γSθTηVδ2. But, by hypothesis, the rectangles together are less than the quantity α. Therefore, the rectangles together with the excess having been removed are much less than the quantity α. Hence, the greater curved region exceeds the lesser by much less excess than α, which is absurd. In fact, it is asserted that there is an excess of the greater curved region about the lesser. Therefore, the curved region RSTVδ2 is not more than the curved region εζρσψωΔ Gamma. Let (if it is able to be done) it be less. It is manifest that the excess of the rectilinear region πρτψφΩΔ Γ above the rectilinear curve γSθTηVδ2 is equal to all of the rectangles πζ, πσ, φω, γξ, θλ, and νμ together with the excess of the rectilinear curve RξSλTμδ2 above the rectilinear curve εζρσψωΔΓ having been removed. But the excess of the greater curved region ερψΩΔΓ above the lesser curved region RSTVδ2 is less than the previously-mentioned excess of the rectilinear curves, since the greater curved region is less than the greater rectilinear figure and the lesser curved region is more than the lesser rectilinear figure. 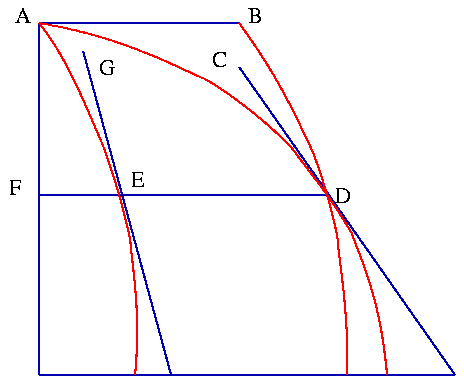 Therefore, the excess of the greater curved region above the lesser is less than the previously-mentioned rectangles together with the excess of the rectilinear figure RξSλT μδ2 above the rectilinear curve ερψΩΔΓ having been removed. But together the rectangles are, by hypothesis, less than α. Therefore, the rectangles together with the excess having been removed are much less than α. Hence, the greater curved region exceeds the lesser curved region by much less than α, which is absurd. In fact, it is asserted indeed that α is the excess of the greater curved region above the lesser curved region. 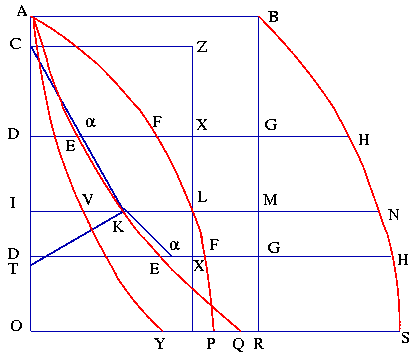 Therefore, the curved region ερψΩΔΓ is not more than the curved region RξSλTμδ2. But it was also demonstrated that it is not less. 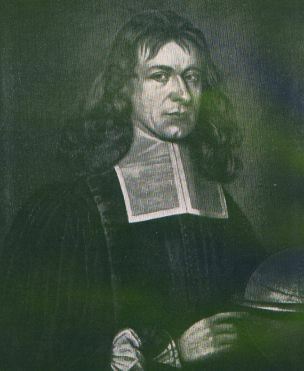 Therefore, the curved regions ερψΩΔΓ and RξSλTμδ2 are equal among themselves, which is what ought to have been demonstrated. There are other cases of this theorem, to all of which this second demonstration is able to be applied. However, I have wished to employ the preceding proof, since it appears more simple to me even if it is not general. Nevertheless, I remind the reader that the preceding proof is able to handle the most general case, namely in the first figures, with the remaining things staying the same while the curve RV is extended more from the line 2δ in the progression from R to V.
From this demonstration, it is manifest that the curved region RSTVδ2 and the surface of the trunk are proportional quantities in magnitude and in weight, since each equality which is demonstrated in the entirety likewise is demonstrated by the same method in their proportional parts. Therefore, their centers of equilibrium in the same manner divide the line δ2. I do not reckon that there is a need to remind the reader that, with this one given surface of a trunk having been presented, all others whose cutting plane cuts the base in that same line (extended if needed) are given. In fact, such surfaces of trunks among themselves are as their altitudes or as the tangents of the inclining cutting planes, as is commonly and easily demonstrated. Let OIGE be any simple and non-winding curve. Let two lines, AD and Lξ, be drawn in any way whatever parallel between themselves and let the line RV be normal to both of these. Let the curved region RVYBD be of such a nature that, with a line GSB drawn wherever you please parallel to the lines AD and Lξ, the line SB extended between the line RV and the curve VYBD is always equal to the line GM tangent to the curve at the point G and extended to the line Lξ. Above the curve OIGE (whose curvature is such that the farther it is extended from the point O the less it is separated from the line RV) let the surface of a right cylinder be imagined cut by a plane passing through the line Lξ and cutting the base of the cylinder in a 45 degree angle. I say that the area of RVYBD is equal to the surface of the lower trunk of the cylinder sectioned by the plane. If they are not equal, let the difference between them be λ and let the line RV be divided into so many equal parts at the points R, S, T, and V, that, when the lines SC, Tδ, and VZ have been drawn parallel to the line RD and the rectangles RC, RB, Sδ, SY, and TZ have been filled out, the difference of the rectilinear figure Rα BXYT inscribed in the curved region with the rectilinear figure RDCBδYZV circumscribing the curved region is less than the quantity λ. Indeed, it is manifest that this is able to be done, since the line RV is able to be divided into more and more parts ad infinitum. Let the parallel lines DR, CS, δT, and ZV be extended to the points E, G, I, and O on the constructed curve. Let the lines EL, GM, IN, and 04, tangent to the curve at the points E, G, I, and O and which intersect the closest parallels in either direction at the points F, H, N, ω, θ, and μ, be extended to the points L, M, N, and O on the line Lξ. Let EQ, GK, and IP be perpendiculars to the nearest parallel lines. It is manifest (because the lines GK and SV are parallel) that GK is to GH as SV is to GM--or SB. Consequently, the rectangle Sδ--that is, the rectangle formed by GK and SB--is equal to the rectangle formed by GH and SV. But the rectangle formed by GH and SV is more than the portion of the trunk of the surface above the curve GI, since the line GH is more than the curve GI and--because the plane cuts the base at a 45 degree angle through the line Lξ--the line SV is equal to the highest altitude of the portion of the surface of the cylinder above the curve GI. Therefore, the rectangle Sδ is more than the portion of the trunk of the surface above the curve GI. In the same manner, the rectangle RC is shown to be more than the portion of the trunk of the surface above the curve GE and the rectangle TZ is more than the surface of the trunk above the curve OI. Therefore, the rectilinear figure RDCBδYZV circumscribing the curved region is more than the entire surface of the trunk. Next, because the lines IP and SV are parallel, as IP is to IN--or GK or ST is to θI--thus is TV to IN--or to TY. Consequently, the rectangle SY--that is, the rectangle formed by ST and TY--is equal to the rectangle formed by θI and TV. But the rectangle formed by θI and TV is smaller than the portion of the surface of the trunk above the curve IG, since the line θI is less than the curve GI and--because the plane cuts the base in a 45 degree angle through the line Lξ--the line TV is equal to the smallest altitude of that same portion trunk of the surface above the curve GI. Therefore the rectangle SY is less than the portion of the trunk of the surface above the curve GI. In the same manner, the rectangle RB is shown to be less than the portion of the trunk of the surface above the curve GE. Consequently, the rectilinear figure TYXBαR inscribed in the curved region is less than the entire surface of the trunk. But, by supposition, the difference between the inscribed rectilinear figure and the circumscribing figure is less than the quantity λ. Therefore, the difference between the truncated surface and the curved region is much less than λ, since either of the two is demonstrated to be more than the inscribed rectilinear area and less than the circumscribed rectilinear area, which is not able to be done. It is supposed that λ is the difference between the surface of the trunk and the curved region. Therefore, there is no difference between the curved region and the surface of the trunk. Consequently, they are equal, which is what ought to have been demonstrated. With these same things being assumed, let the curved region VYBD23ξ be of such a nature that from any point you please, say, G, on the curve EO, when the line, say, G2, has been drawn parallel to the line Lξ, the segment B2 between the two curves VD and Dξ is equal to the tangent to the given curve at the point G extended to the line AD, namely, the line Gμ. I say that the curved region VYBD23ξ is equal to the upper surface of the trunk of the cylinder given above whose altitude is the line RV. Let G7, cutting the line RV at the point 7, be the line normal to MGμ at the point G. Because of the similarity of the triangles SG7 and GKH, as GS is to G7 thus is GK to GH. And as GK is to GH, thus is SV to GM--or SB--and also SR to Gμ--or B2. Therefore, GS is to G7 as RV is to S2. In this same manner it is able to be demonstrated that IT is to I8 as RV is to T3. And since this holds at all points of the curve EO, it is manifest from Proposition Two that the curved region RD2 3ξV is equal to the surface of the right cylinder above the curve EO and whose altitude is RV. But the surface of the lower trunk is equal to the curved region RVYBD and consequently the surface of the upper trunk is equal to the curved region DBYVξ3 2D, which it was desired to demonstrate. Likewise, from this it is manifest that the surface of the lower trunk and the region VYBD are proportional quantities in magnitude and in weight, since this same equality which was demonstrated for the entirety is demonstrated in the same manner for their proportional parts. It is also manifest that the surface of the upper trunk and the region VYBD 2eξ are proportional quantities in magnitude and in weight. In fact, the curved region RVξ3 2 D is proportional in magnitude and weight to the entire surface of the right cylinder and the curved region RVYBD is proportional in magnitude and weight to the surface of the lower trunk. Therefore, (because it is left over) the curved region DBYVξ3 2 D is proportional to the remaining surface of the upper trunk. The cases of this proposition are diverse, but in all of them the preceding conclusion is able to be verified in the same manner. Let two curves AE and AD be drawn to the line AF and let the line AF be perpendicular to the line FD cutting the curves in the points E and D. Let the lines GE and CD be drawn tangent to the curves. I say that the lines EG and DC are not parallel. Let them (if possible) be parallel and let the line AB be drawn parallel and equal to the line ED. Then through the points B and D let a curve agreeing in all parts with the curve AE be drawn, with the provision that the point A is placed above the point B and the point E is placed above the point D. It is manifest that the curve BD cuts the curve AD and that moreover the line CD parallel to the line GE is tangent to the curve AD. 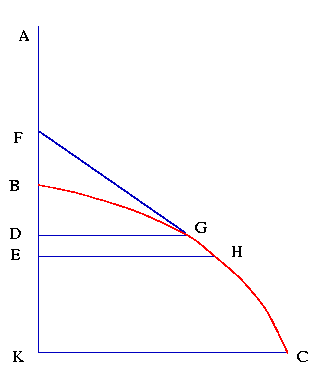 But by supposition CD is also tangent to the curve BD, which is absurd, since the curves AD and BD cut each other. Therefore, the lines CD and GE are not parallel, which is what ought to have been demonstrated. It ought to be noticed that we show this important result for those simple curves which, the longer the distance from A, the greater the line ED cut off. For on this supposition depends the strength of the demonstration. 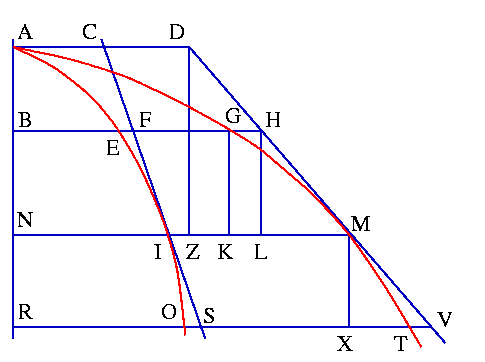 To find a curve which has the same ratio to its axis as any exhibited figure has to a rectangle inscribed in it and applied to a given line or axis of the sought-after curve. Let the exhibited figure be ABSO and let the inscribed rectangle be ABRO. Let the curve BS be simple or non-winding, but if it is not, the curve ought to be divided into many simple parts and the demonstration carried out separately. Next, let the curve AFLP be of such a nature that when any line IN is drawn normal to the line AO and cutting the curve AFLP in L, the square on IN will equal a sum of the squares of both IL and IM. Next, let the curve AEKQ be drawn of such a nature that when any line IM is drawn perpendicular to the line AO and cutting the curve AEKQ in K and AFLP in L, the rectangle MIK is equal to the curved region IAFL. I say that the figure ABSO is to the rectangle ABRO as the curve AEKQ is to the line AO. For let K be a point on the curve AEKQ, through which is drawn the line IN perpendicular to the line AO and cutting the curves AFLP, BR, and BHNS in the points L, M, and N. Let IK be to IC as IL is to IM and let KC be drawn. The line KC either cuts or is tangent to the curve AQ in the point K. If possible, let it cut the curve at K and let it fall within the curve at a point E toward the vertex A. 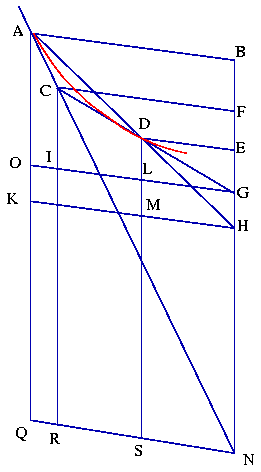 Through the point E let a line DH be drawn parallel to IN and cutting AQ, AP, BR, and BS in the points E, F, G, and H, and the line KC in α. Also, complete the rectangle ILZC, whose side LZ cuts the line DH at X. Since IL is to IM as IK is to IC, the rectangle MIK--or the curved region IAFL--will be equal to the rectangle IZ. Since the rectangle GDE is equal to the curved region DAF, as IK is to DE thus will the curved region IAFL be to the curved region DAF. But IK has a greater ratio to DE than to Dα. Thus, the curved region IAFL has a greater ratio to the curved region DAF than IK has to Dα--or IC has to DC. Therefore, the curved region IAFL has a greater ratio to the curved region DAF than the rectangle IZ has to the rectangle DZ, and, per conversionem rationis, the curved region IAFL has a smaller ratio to the curved region IDFL than the rectangle IZ has to the rectangle IX. By permuting, the curved region IAFL has a smaller ratio to the rectangle IZ than the curved region IDFL has to the rectangle IX. Since the rectangle IZ is equal to the curved region IAFL, the rectangle IX will be less than the curved region IDFL. But it is also more than the curved region IDFL, which is absurd. Consequently, the line KC does not fall within the curve AQ toward the vertex. If possible, let the line CK fall within the curve toward the base, with the remaining things holding as in the previous situation. As IK is to DE, thus will the curved region IAFL be to the curved region DALF. But IK has a greater ratio to DE than to Dα. Therefore, the curved region IAFL has a greater ratio to the curved region DALF than IK has to Dα--or IC has to DC. Therefore, the curved region IAFL has a greater ratio to the curved region DALF than the rectangle IZ has to the rectangle DZ. Through inverting, conversionem rationis, and inverting in turn, the curved region IAFL has a greater ratio to the curved region IDFL than the rectangle IZ has to the rectangle IX. By permuting, the curved region IAFL has a greater ratio the rectangle IZ than the curved region IDFL has to the rectangle IX. Since the curved region IAFL is equal to the rectangle IZ, the rectangle IX will be more than the curved region IDFL. But it is also less, which is absurd. Therefore, the line CK does not fall within the curve AQ toward the base. Thus, the line KC is tangent to the curve AQ in the point K.
Let the line KT, intersecting the line AO in T, be perpendicular to the line CK. It is manifest that CI is to CK as IK is to KT. But CI is to CK as MI is to NI, since the lines IN, IM, and IL are a right triangle similar to the triangle CIK, with sides IM and IN corresponding to the sides CI and CK. Consequently, as IK is to KT, thus is IM to IN. Since it is done in the same manner for all points of the curve AQ, it is manifest from Proposition Two that the line AO is to the curve AQ as the rectangle OB is to the figure ABSO, which it was desired to demonstrate. The inverse of this proposition is also easily demonstrated. To be sure, if the line AO is to the curve AQ as the rectangle OB is to the figure ABSO--likewise, if the curve AP is of such a nature that when IN is drawn perpendicular to some line AO, its square will be a sum of the squares of IL and IM--the rectangle MIK will be equal to the curved region IAFL. If it is not thus, let a curve AVY be drawn of such a nature that the rectangle MIV is equal to the curved region IAFL. It will be demonstrated that the lines (which touch the curves AY and AQ in the points V and K) are parallel between themselves, which is a contradiction of the preceding proposition. In fact, there are various cases of this proposition. But when this case is understood, no difficulty remains in the remaining cases. To draw a line tangent to a given curve at a given point of the curve if the curve is from the category which Descartes calls Geometrical. Let the curve BHC be a hyperbola whose diameter is the line AK and whose ordinates EH and KC are of such a nature that the solid formed by the square on BE together with AE is to the solid formed by the square on BK together with AK as the cube on EH is to the cube on KC. Let the given AB be a, let BE be b, and let the ratio of the solid from the square on BE together with AE be to the cube on EH as a3 is to c3. It is desired to find a point F so that the line FH touches the hyperbola in the point H.
3√(c3 a b2 - 2 c3 a b o + c3 a o2 + c3 b3 - 3 c3 b2 o + 3 c3 b o2 - c3 o3)/ a. 3√(c3 a b2 z3 - 2 c3 a b z3 o + c3 a z3 o2 + c3 b3 z3 - 3 c3 b2 z3 o + 3 c3 b z3 o2 - c3 z3 o3)/ a. = c3 a z3 o - 2 c3 a b z3 - 3 c3 b2 z3 + 3 c3 b z3 o - c3 z3 o2. is left over. By adding the defects and by dividing everything through by c3 b z2, the equation is 3 b a + 3 b2 = 2 a z + 3 b z. Consequently, the line EF, namely, z = (3 b a + 3 b2)/(2 a + 3 b), which is what ought to have been found. Let ADIM be a curve whose axis is AL and let AFKO be another curve of such a nature that when any line HIK is drawn perpendicular to the line AL the curve AI is to the line IK as P is to Q. It is desired to draw a line tangent to the curve AFKO at the point K.
Let a line BI be drawn tangent to the curve ADIM at the point I (we suppose in fact that this is able to be done) and let the line IB be equal to the curve AI. Let the line BK be drawn. I say this line is tangent to the curve AFKO in the point K.
If it does not touch the curve, let it fall within the curve and let G be a point on the line within the curve in the direction of the vertex. Let a line GFEDC be drawn parallel to KH. It is manifest that IK is to EG as IB is to EB and, per conversionem rationis, IK is to the difference between IK and EG as IB is to IE. By permuting, as IK is to IB (or the curve IA)--that is, as Q is to P--thus the difference between IK and EG is to EI. But as Q is to P, thus DF is to the curve DA. Therefore, as IK is to the curve IA thus DF is to the curve DA. By permuting, as IK is to DF, thus the curve IA is to the curve DA. Per conversionem rationis, as IK is to the difference between IK and DF, thus the curve IA--or the line IB--is to the curve ID. But the difference between IK and EG is more than the difference between IK and DF, since the point G is supposed to lie within the curve. Hence, IK has a smaller ratio to the excess beyond EG than to the excess beyond DF. Therefore, IB is in a smaller ratio to IE than to the curve DI. Therefore, IE is more than the curve DI, which is absurd. (See Proposition One.) Therefore, the line BK does not fall within the curve AFKO toward the vertex. Let the line fall inside the curve in the direction of the base at the point R (if it is able to be done). IK is to NR as IB is to NB, and IK is to the difference between IK and NR as IB is to IN. By permuting, as IK is to IB (or to the curve IA)--that is, as Q is to P, thus the difference between IK and NR is to IN. But as Q is to P, thus MO is to the curve MA. Therefore, as IK is to the curve IA thus MO is to the curve MA. By permuting, as IK is to MO thus the curve IA is to the curve MA. As IK is to the difference between IK and MO thus the curve IA--or IB--is to the curve IM. But the difference between IK and NR is less than the difference between IK and MO since we suppose that R falls within the curve. Hence, IK has a greater ratio to the difference between IK and NR than to the difference between IK and MO. Therefore, IB is in a greater proportion to IN than to IM. Consequently, IN is les than IM, which is absurd. Hence, the line BK does not fall within the curve toward the base and hence touches the curve in the point K, which it was desired to demonstrate. Through this proposition curves of all cycloids are able to be compared with their own axes or bases following the method of Proposition 2. Let AEIO be a curve whose axis is AR and let AGMT be another curve of such a nature that when any line NIM is drawn perpendicular to the line AR, the curve AI is to the line NM as P is to Q. It is desired to draw a line tangent to the curve AGMT at the point M.
Let a line IC be drawn tangent to the curve AEIO at I (we suppose in fact that this is able to be done) and intersecting the line AD parallel to NM at C. Let MZ be to the line IC as Q is to P and let ZD be parallel to the line AR. Let the line DM be drawn. I say this line is tangent to the curve AGMT at the point M.
If it were not tangent, let it fall within the curve and let H be a point within the curve toward the vertex. Let a line be drawn parallel to NM and cutting the remaining lines as in the figure. AE is to BG as P is to Q and AI is to NM as P is to Q. Consequently, as AE is to BG, thus AI is to NM. By permuting, as AE is to AI, thus BG is to NM, and as AE is to EI thus BG is to KM. By permuting, as AE is to BG--that is, as P is to Q--thus EI is to KM. Therefore, as CI is to ZM--that is, as P is to Q--thus FI is to LM, which I demonstrate as follows: The ratio of CI to ZM is composed of the ratio of CI to DZ and the ratio of DZ to ZM, and the ratio of FI to LM is composed of the ratio of FI to HL--or CI to DZ--and the ratio of HL to LM--or DZ to ZM. Consequently, as EI is to KM, thus FI is to LM. By permuting, as EI is to FI thus is KM to LM. But since we suppose that H falls within within the curve, KM is less than LM and consequently EI would be less than FI, which is absurd. (See Proposition One.) Therefore, the line DM does not drop within the curve toward the vertex. Let it fall within the curve in the direction of the base at the point V (if it is able to be done). AI is to NM as P is to Q, and AO is to RT as P is to Q. Therefore, AI is to NM as AO is to RT. By permuting, AI is to AO as NM is to RT, and as AI is to IO thus NM is to XT. By permuting, as AI is to NM--or as P is to Q--thus IO is to XT. Consequently, as CI is to ZM--or P is to Q--thus IS is to XV (which is proved as in the previous case). Therefore, as IO is to XT thus IS is to XV. By permuting, as IO is to IS, thus XT is to XV. But (since we suppose that V falls inside the curve) XT will be more than XV. Therefore IO will be more than IS, which is absurd. (See Proposition One.) Therefore, the line DM does not fall inside the curve in the direction of the base. Consequently, DM is tangent to the curve at the point M, which it was desired to demonstrate. Through this proposition, the curve of any surface of a truncated right cylinder expanded into a plane is able to be compared with its axis or the base with the aid of Proposition Two, if the tangent line to the base of the cylinder is able to be drawn at a given point. Let AD be any curve and let BN be any line. From any two points A and D of the curve let two parallel lines be drawn to the line BN, namely, AB and DE, and let the line AD be brought together and extended to H. Let the lines DG and AN be drawn tangent to the curve in the points A and D. Next, let the parallelograms ABGO and DENS be completed and let the lines AO and NS be extended so that they intersect at Q. I say that the trapezoid ADEB is more than the curved region ADLO. Let HK be drawn parallel and equal to the line AB. It is manifest that the trapezoid ADEB is equal to the trapezoid ADMK. Also, the trapezoid ADMK is more than the trapezoid ADLO and therefore is much more than the curved region ADLO. Therefore, the proposition is clear, namely, that the trapezoid ADEB is more than the curved region ADLO. Let the line DG be extended to C. I say that the rectilinear region ABEDC is less than the curved region ADSQ. Let the line CF be drawn parallel to the lines AB and DE and let CR be drawn parallel to the lines AQ and DS. It is clear that the trapezoid ABFC is equal to the trapezoid ACRQ and that the trapezoid CFED is equal to the trapezoid CDLI. Consequently, the rectilinear region ABEDC is equal to the rectilinear region ACDLIRQ, which is less than the rectilinear region ACDSQ. Therefore, the rectilinear region ABEDC is much less than the curved region ADSQ, which is what ought to have been demonstrated. Let ABKI be any region contatined by the curve BK, the line AI, and two parallel lines BA and KI. Let the curve MY be of such nature that (with some point C on the curve BK having been assumed and out of that point a line CE having been drawn parallel to the line AB and a line CZ having been drawn tangent to the curve BK and terminating at the line AI, extended to Z if necessary) the line EZ is always equal to the line CS parallel to the line AZ and terminated at the curve YM. I say that the curved region BKMY, contained by the curves BK and MY and the lines BY and KM parallel to the line AZ, is equal to the curved region BAIK. If they are not equal, let X be their difference and let the curvilinear figure BKMY be divided by so many lines CS, GP, and KM, parallel to the line BY, that (with the lines OM, QN, TR, and YV drawn parallel to the line AB) all the parallelograms ON, QR, and TV together are less than X. This is able to be done by the indefinite number of parallels. Let the subtending lines BC, CG, and GK and the tangents, BD, DF, FL, and KL at the points B, C, G, and K be drawn. It is manifest from the preceding proposition that the trapezoid ABCE is more than the curved region BCST, the trapezoid CEHG is more than the curved region CGPQ, and the trapezoid GHIK is more than the curved region GKMO. Therefore, the rectilinear figure ABCGKI is more than the curved region BKMOPQST. It is also clear from the preceding proposition that the rectilinear figure ABDCE is less than the curved region BCVY, the rectiliniear figure ECFGH is less than the curved region CGRS, and the rectilinear figure HGKI is less than the curved region GKNP. Consequently, the rectilinear figure ABDFLKI is less than the curved region BKNPRSVY. Therefore, since the curved region BAIK is between the rectilinear figures ABCGKI and ABDFLKI and the curved region BKMY is between the curved regions KMOPQSTB and KNPRSVYB, and likewise the rectilinear figures ABCGKI and ABDFLKI are between the curved regions BKMOPQST and BKNPRSVY, it is manifest that the curved regions ABKI and KMYB differ by a smaller quantity than the curved regions BKMOPQST and KNPRSVYB. But, by supposition, the difference of these is less than X. Therefore, the difference of the areas ABKI and BKMY is much less than X, which is absurd. It is supposed that their difference is more than X. Therefore, there is no difference between the curved regions ABKI and BKMY. Hence they are equal, which is what ought to have been demonstrated. The demonstration of the two preceding results would be nearly the same even if the convexity of the curve BK were in the direction of the line AI.